All our recreational sessions are mixed age and mixed ability making life as simple as possible for our families. Sessions are 1 hour and 15 minutes long. The first 10 minutes for warm-up and stretching, followed by 60 minutes of bouncing time and 5 minutes of cool-down and stretching at the end. 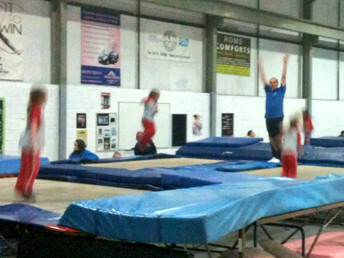 All our recreational gymnasts work through the British Gymnatics Proficiency Award Scheme during their sessions. Coaches sign moves as completed once they have been shown to a good standard. Gymnasts are then awarded a certificate and badge.